Looking for movie tickets? 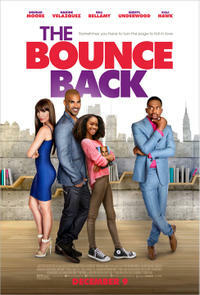 Enter your location to see which movie theaters are playing The Bounce Back near you. Matthew Taylor is on a whirlwind book tour promoting his new best seller, The Bounce Back. He's got it all figured out until he meets the acerbic Kristin Peralta, a talk show circuit therapist who's convinced he's nothing but a charlatan. Predictable romcom will appeal most to adults.